Protecting your family, staff and valuable stock are critical reasons to include 7in1 vaccination in your herd health program. Leptospirosis can be a devastating disease in herds and in people. In cattle it can give rise to a number of syndromes including mastitis and abortions in mature cows, and severe, often fatal disease in calves. It is also a zoonotic disease, which means it can infect people, and can cause severe ongoing health consequences. It can easily be prevented by vaccinating the herd for less than $2 per cow. Most calves get their initial booster injections, but we find this is seldom followed up with 12 monthly boosters in the adult herd as recommended. Leptospirosis is a bacterium that persists in the kidneys of infected animals. It is shed in urine which is a source of infection for other animals and humans. It can survive in wet environments including stagnant water, effluent and wet soil. There are many different strains of leptospirosis which persist in a variety of animals. Pigs, cows and rodents can all be hosts. Strains that cause mild disease in the host animal can go on to cause severe disease in a different species. There are 2 main strains of Leptospirosis that infect cattle. 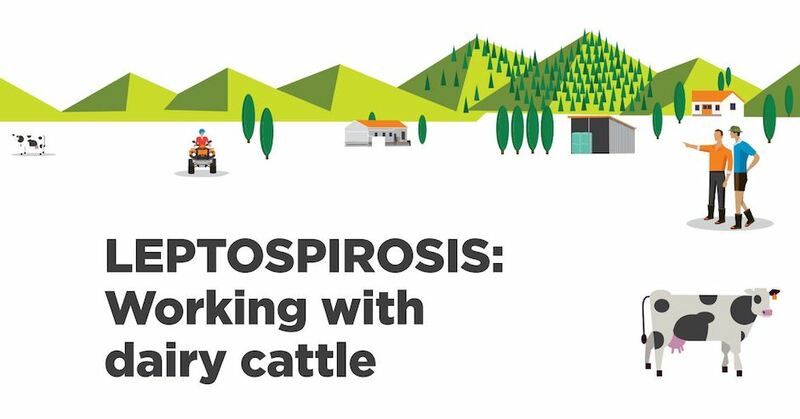 Leptospirosis Hardjobovis is a cow adapted strain which causes less severe signs in cattle, while Leptosporosis Pomona normally resides in pigs and can cause more severe disease when cattle are infected. Signs of infection with leptospirosis include mastitis in all four quarters, with milk appearing thick and colostrum like and/or blood tinged, with small clots and an associated increase in ICC. Unlike most other cases of mastitis there is no inflammation of the udder, and the udder appears limp ‘flabby bag’. A concurrent drop in milk production lasting 2-10 days is also prominent. Abortion and stillborn or weak and premature calves are also a manifestation of the disease. In both Hardjobovis and Pomona strains, abortion commonly occurs 6 to 12 weeks after the initial infection, usually from 4 to 7 months gestation. Diagnosis can be difficult and time consuming and involves taking paired blood samples from affected animals to monitor rising antibody levels, and also post mortem examination of affected calves or fetuses. Calves infected with Leptospirosis Pomona have severe disease: the bacteria localize in the kidneys, resulting in ‘redwater’ (red urine), and is usually fatal. Calves can also be infected with a different strain of leptospirosis contracted from rats, which infect calves by urinating in feed and water sources. People are infected by contact with urine from affected cows or calves. Leptospirosis can enter the body through cuts in the skin, or via contact with mucous membranes of the mouth or eye. Infection can be as simple as a drop of urine landing on a persons eye – a commonplace occurrence in many dairies, or through assisting cows during the calving process. Contact with aborted and sick calves or foetal membranes are also possible methods of transmission. Initial signs of infection with Leptospirosis are flu like symptoms: fever, chills, vomiting, diarrhea, abdominal pain, headache, photophobia (fear of light), and muscle aches. There may be an apparent recovery, however this is often followed by a relapse. Up to 10% of infections can progress to Weils disease, a very serious form of leptospirosis involving liver failure, kidney failure, meningitis and hemorrhage. Prolonged periods of convalescence and inability to work are commonplace. Treatment requires diagnosis and antibiotic therapy, but this must be given in the early stages of infection. Hospitalisation may be necessary and some cases are even fatal. Recovery can be slow, and chronic fatigue like symptoms can last for months, also persistent headaches or chronic inflammation of the eye can occur. It is simply not worth putting yourself, your employees and your family at risk of contracting leptospirosis when a simple and effective preventative strategy can be put in place. The 2 main strains of Leptospirosis encountered in dairy cattle are included in the 7 in 1 vaccine. Dairy cattle should receive an initial vaccination program as calves. Previously unvaccinated cows should also receive an initial injection and booster. The time of the annual booster can be at a convenient time, ie when all cows are milking or at dry off.